Based on the encouraging results from prostate cancer trials, clinical trials have been conducted where patients with brain cancer are treated with ALECSAT immunotherapy. Patients with Glioblastoma Multiforme (GBM) brain cancer have a very significant need for better treatment options. Current existing treatments only have limited overall survival effect and many have serious side effects. CV003 (Clinical phase I) Safety and applicability of ALECSAT in the treatment of GBM. Glioblastoma (stage IV) patients, that could not be given any further standard treatments, have been treated with repeated doses of ALECSAT and evaluated in this clinical phase I study. Due to the very serious and rapid development of this cancer disease, it was not possible to give all the patients the intended 3 ALECSAT treatments. However, repeated ALECSAT treatments were seen to be well tolerated and no side effects were seen that could be associated to the treatments. In the study, it was also seen that some patients receiving ALECSAT treatments experienced prolonged survival. For some patients, that received the three treatments according to the protocol, reductions in tumor size and some apparent improved Quality of life was also seen. CV005 (Clinical phase II) An investigation of the efficacy of ALECSAT in treatment of patients with relapsed GBM, compared to standard of care second line treatment Avastin/Irinotecan. The study was an open-labelled, randomized multicenter study, aimed at comparing progression-free survival (PFS) in patients with relapsed GBM when the subjects were treated either with ALECSAT immunotherapy or the Danish standard second line therapy with Avastin/Irinotecan. The patients in the study were recurrent GBM stage IV patients that had received both first and second line treatments. 25 subjects were analyzed, 15 patients in the ALECSAT arm and 10 patients in the Avastin/Irinotecan control arm. The study was terminated by sponsor as it was evaluated that the study would not reach the intended primary endpoint and advice from the European Medicines Agency (EMA) suggested that several protocol amendments should be applied. CV006 (Clinical phase II) An investigation of the efficacy of ALECSAT in treatment of patients with newly diagnosed GBM, when ALECSAT is given in addition to first and second line standard of care treatments. An open-label, randomized, phase II multicentre study to investigate the efficacy and safety of ALECSAT treatment as an add-on therapy to standard of care (SOC) in patients with newly diagnosed GBM. The objective is to compare Overall Survival (OS) between patients who receive SOC treatment only – to patients that also receive ALECSAT as an add-on therapy. In this study ALECSAT immunotherapy treatment is initiated already at the time of diagnosis, in addition to normal standard of care treatment. This clinical phase II study is ongoing at five clinical centres in Sweden, the primary investigator site is Sahlgrenska University hospital in Gothenburg. The study is also conducted at clinical sites at the Karolinska Universty hospital in Stockholm, the university hospitals in Uppsala and Lund, and the hospital in Jonköping. Tumor volume estimated by MR scanning indicates that the tumor volume for this patient is reduced 76% over 11 months The PET active tumor tissue is seen to be reduced over 5 months of ALECSAT treatments. The data from this study indicate no safety concerns related to repeated administrations of ALECSAT to relapsed GBM patients, even though these GBM patients are a considerably more fragile group of patients compared to prostate cancer patients that participated in the CV001 and CV002 studies. Brain Scanning of the 10 patients completing the study protocol, in 6 patients MRI of the brain showed stable disease at some time point during the trial. Several patients showed a continued shrinkage of tumour volume with a remarkable reduction of tumour size. Intratumoural increase of CD8+ cells (Cytotoxic T cells/Killer cells) observed by histopathological analysis in re-operated patients. Preliminary conclusions suggest that ALECSAT treatments may have a clinically relevant positive effect on these patients disease regarding both survival, tumor size / growth and quality of life. This figure shows how long the 10 patients that received 3 ALECSAT treatments have lived after entering the ALECSAT study. The 1. 2. and 3. ALECSAT treatment is given at the end of the blue, red and green part of the bars. The green part of the bars is follow up period where additional treatmens are given every 3 – 4 months. This clinical phase I study that was designed to show safety and tolerability, and the conclusion is that ALECSAT treatments are safe and well tolerated by GBM patients. 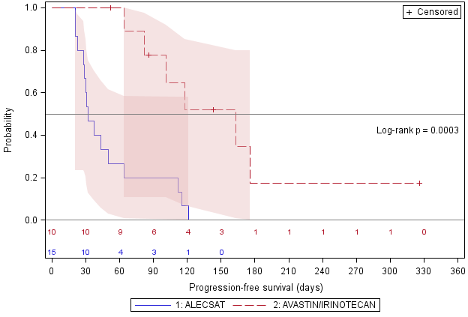 For the 10 patients that received 3 or more ALECSAT treatments there are good indications for prolonged survival the average survival was 25,6 months. Furthermore there are patients where the brain tumor size has reduced considerably during and after the study – which is quite unusual for late stage recurrent GBM patients. These encouraging results warranted that clinical phase II trials were initiated to verify if ALECSAT could be applied to the treatment of late stage recurrent Glioblastoma Multiforme. So far only few brain cancer patients have been treated with ALECSAT – so the clinical efficacy observations that are seen in this study are not yet statistically significant. The clinical effect of ALECSAT is therefore not finally proven. The ongoing Phase II clinical trial will include a sufficient number of study subjects and a control group so the statistical significance may be demonstrated. Study investigators and sites: There was one principal investigator at Department of Neurosurgery at Copenhagen University Hospital, Rigshospitalet, and the Principal coordinating and signatory investigator was staff doctor Walter Fischer, Department of neurology, Copenhagen University Hospital, Rigshospitalet, 2100 Copenhagen, Denmark. The primary objective for this study was to establish if any side effects or toxicity issues occur, that will prevent further clinical development of the ALECSAT therapy in GBM or to establish if there were side effects or toxicity issues, that will suggest that the further clinical development planned, has to change course significantly. The secondary objective for this study was to establish if any indications of a positive therapeutic or palliative effect could be observed. Be over the age of 18 and capable of understanding the information and giving informed consent. Treatment with chemotherapy three weeks prior to inclusion in the clinical study. Inclusion in other clinical studies 6 weeks prior to inclusion in the study. The subject’s medical condition is evaluated to be so poor that there is a significant risk for the subject to be part of the study and to evaluate any effects of the treatment. Dose: In total 47 doses were administered during the study period. The mean number of cells in the above mentioned batches were 156 million (range 5. 4 million – 1. 8 billion; median 68 million) and the mean viability 94 % (range 83 – 100%, median 95%). Administration: Slowly intravenously over a period of approximately 5 minutes through a venflon. During the 20 week study period, a total of 56 adverse events were reported in 23 patients exposed to the study product. Out of the 56 events, 24 events were reported as serious adverse events in 18 of the 23 patients. 12 patients were reported dead during the study period. All reported adverse events/serious adverse events were considered as likely non-treatment-related by the investigator. There was not detected any safety related trends in the assessed blood work and EORTC questionnaire. Based on this study, immunotherapy with ALECSAT, as stand-alone treatment, show trends of efficacy in terms of stable disease in some of the subjects measured by MRI and PET. The trend of efficacy is remarkable in the light of that the ALECSAT treated subject had received all possible treatments before entering the study. The results from the study show no unexpected, adverse events. The result from the study encourages us to proceed to next study phase, a controlled study with the ALECSAT product. To compare progression-free survival (PFS) in subjects with relapsed glioblastoma multiforme (GBM) when the subjects were treated either with ALECSAT immunotherapy or standard praxis therapy with Avastin/Irinotecan. To evaluate the overall survival (OS) during the study period in subjects treated with ALECSAT compared to subjects treated with Avastin/Irinotecan by Kaplan-Meier methodology. To evaluate time to progression in the two treatment groups. To compare PFS in the two treatment groups by Kaplan-Meier methodology upon study completion. To compare PFS in a landmark analysis in the two treatment groups after a duration of 6 and 12 months after initiation of treatment. To compare objective response rate (ORR). To investigate Quality of Life (QoL) and performance status during the study period for subjects treated with ALECSAT compared to subjects treated with Avastin/Irinotecan. To investigate any changes in leucocytes and lymphocytes during the study period for subjects receiving ALECSAT. To investigate radiological changes as measured by magnetic resonance imaging (MRI) during the study period for the ALECSAT group and compare the results with the Avastin/Irinotecan treated group. To characterise the safety and tolerability of ALECSAT treatment. This study was a prospective, open-label, randomised, parallel group study with ALECSAT compared to Avastin/Irinotecan in GBM patients with verified relapsed disease after or during treatment with standard regimen or another recognised first-line treatment. The subjects in the two treatment groups were to be followed at 18 planned study visits for up to 62 weeks. After informed consent and check of inclusion and exclusion criteria, baseline evaluations were performed, including medical history, electrocardiogram (ECG) and baseline MRI scan of tumour. Subjects in the ALECSAT group donated blood for production of the ALECSAT product 3 weeks prior to each ALECSAT treatment (at weeks 4, 9, 14, 26 and 46). Subjects in the Avastin/Irinotecan group were treated with Avastin/Irinotecan on visit 1 (day 0) and every 2 weeks according to standard practice. MRI scan, QoL and performance status was performed regularly for efficacy assessments. In addition to MRI scan, 18F-fluoro-ethyl-tyrosine (18F-FET) Positron emission tomography (PET) scan was performed at Copenhagen University Hospital, Rigshospitalet. Safety blood samples, vital signs, physical examination and adverse event monitoring were performed frequently during the study. A total of 175 subjects were planned, distributed as 105 subjects in the ALECSAT group and 70 subjects in the Avastin/Irinotecan group. Since the study was terminated early, 25 subjects were analysed, 15 subjects in the ALECSAT group and 10 subjects in the Avastin/Irinotecan group. The subjects enrolled in this clinical study were patients with advanced GBM with documented relapse during, or after completing, first line treatments. Women in fertile conditions could only be included with a negative pregnancy test at screening and had to use appropriate contraceptives during the study. Positive tests for anti-HIV-1/2; HBsAg, anti-HBc, Anti-HCV or being positive in a Treponema pallidum test (syphilis). Subjects who may have been exposed to West Nile virus, Dengue or Ebola virus or HTLV-1 virus prior to donation should be excluded. Concurrent illness, e.g. uncontrolled epilepsy, cardiovascular-, cerebrovascular-, and/or respiratory disease which could worsen or cause complications in connection with blood donation. Clinically significant autoimmune disorders or conditions of immune suppression. Haemoglobin count ≤ 7.5mmol/L (men and women). Lymphocyte-numbers below 0.5 x 109/L. Body weight below 40 kg (men) and 50 kg (women). Clinically abnormal ECG as judged by the Investigator. Inclusion in other clinical studies 4 weeks prior to inclusion in the study. Any medical condition that will render participation in the study risky or, according to the Investigator will make the assessment of the study endpoints difficult. Treatment with any immunotherapy, cytotoxic therapy or, biologic therapy 4 weeks prior to enrolment in this study. Subjects that either may be put at risk due to the blood donation or where it is not expected that an ALECSAT product of good quality can be produced (judged by the Investigator). Subjects with uncontrolled serious bacterial, viral, fungal or parasitic infection. Blood transfusions within 48 hours prior to donation of blood for ALECSAT production. Known or suspected intolerance to Avastin, Irinotecan or any of the excipients as well as intolerance to recombinant humanised antibodies. Performance status ≥ 3 (according to WHO/ECOG performance status score). The ALECSAT treatment contained 1×107 – 1×109 cytotoxic T-lymphocytes (CTL) and natural killer (NK) cells generated from autologous blood donated by the individual study subject prior to each treatment cycle. Each batch of ALECSAT was therefore a subject-specific single dose. The first ALECSAT treatment was given on visit 2 (week 4). The following administrations were given in uneven intervals at weeks 9, 14, 26 and 46. Due to early termination of the study, no subjects received study product at weeks 26 and 46. Duration of treatment: Treatment duration was planned for up to 62 weeks. Subjects allocated to the Avastin/Irinotecan treatment were treated in accordance with standard practice in Denmark for GBM patients. Treatment with Avastin/Irinotecan started at study visit 1 (day 0) and was given as up to 16 treatment cycles with 4 weeks duration. Each cycle consisted of 2 dosing days; day 1 and day 15 in the cycle. Since the study was terminated early, some endpoints deemed irrelevant or unfeasible to analyse as planned. Some endpoints were re-defined, and others (especially exploratory analyses) were deemed irrelevant and not performed. PFS measured by MRI. Progression of disease was defined according to the response evaluation criteria for solid tumours (Response Assessment in Neuro-Oncology Criteria, RANO). OS, the number of subjects still alive at the end of study. PFS landmark after 6 and 12 months – was changed to event rates after 3, 4 and 5 months due to early termination of the study. OS landmark proportions after 6 and 12 months – was changed to event rates after 3, 4 and 5 months due to early termination of the study. ORR defined as the response rate of subjects having a complete or partial response. EORTC QoL Questionnaires EORTC QLQ-C30 and QLQ-BN20 and performance status according to WHO/ECOG performance status score. Changes in leucocytes and lymphocytes in the ALECSAT group. Changes in tumour size measured by MRI – this was not performed since tumour diameters were not available. Presence of adverse events (AEs) and serious AEs during the study period. Presence of clinically significant changes in biochemistry and haematology parameters. Presence of medical events of special interest (MESI) – MESIs were not classified or reported due to early termination of the study. In the protocol, all time-to-event related endpoints were defined as time-from-randomisation-to-event endpoints, but due to the asymmetric duration from randomisation to first study product administration in the two treatment arms, some endpoints were supplemented by a corresponding time-from-first-study-product-administration-to-event endpoint. All statistical tests were performed using a two-sided test at a 5% significance level. Results from analyses werepresented with estimates, 95% confidence intervals and p-values. For log-transformed analyses, the anti-log transformation was applied before presentation. Numerical data were presented in summary tables by number of subjects, arithmetic mean (geometric mean and coefficient of variation [CV] where applicable), median, standard deviation, minimum and maximum (and CV in % where applicable). Categorical data were to be presented by the number and the percentage of subjects (and number of events where applicable). Subjects with neither disease progression nor death were censored at the last tumour assessment date where they were known not to have progressed. Subjects with no tumour assessments after baseline but who were still alive at the time of the clinical cut-off were censored at day 1 (worst case assumption). If several response evaluations for a subject were progressive disease, the date of the first of these measurements was used in the survival analysis of PFS. The primary efficacy hypothesis to be tested was that the median time to event for PFS within the ALECSAT treatment group would be superior to the median time to event for PFS in the comparator treatment group. This hypothesis was tested by using a two-sided log-rank test at a significance level of 5% to test the null hypothesis of the hazard ratio, HR, being equal to 1 with the alternative of the hazard ratio being different from 1. Estimated survival curves for OS and time to progression were tabulated and displayed in Kaplan-Meier plots, and the treatment groups were summarised similar to the primary efficacy analysis, including a comparison based on a log-rank test. The objective response rates (ORR) were tabulated for the two treatment arms and compared by a two-sided chi-square test along with the estimated odds ratio and the corresponding 95% confidence interval. QoL scales were as to be tabulated and displayed in figures according to treatment and visit, but no formal statistical evaluation had been planned. An interim analysis for futility was planned, but since the study was prematurely terminated after 25 subjects, the analysis was no longer relevant and therefore not performed. A total of 27 subjects were screened and 25 subjects were enrolled and treated in the study, 15 in the ALECSAT group and 10 in the Avastin/Irinotecan group. All subjects were discontinued prior to completing the study; 18 subjects discontinued due to progression of disease, 2 subjects discontinued due to Investigator’s recommendation, 3 due to other reasons, and 2 subjects were discontinued when the study was terminated by Sponsor. A total of 12 females and 13 males, representing ages from 46 to 73 years were included in the study. All subjects were white; the average height was 1.74 m and the average weight 78.1 kg. There was a slight imbal-ance in body weight at baseline; otherwise no apparent imbalances were found in the baseline characteristics. All subjects had a normal ECG or ECG with no significant findings at baseline. Physical examination of abdomen, chest, heart, lungs, skin, and peripheral pulse was normal for all subjects. The physical examination revealed abnormal clinically significant findings for the head in 2 subjects in the ALECSAT group, for ears/eyes/nose/throat in 1 subject in each treatment group, and for other physical conditions / undefined in 1 subject in each treatment group. All subjects had performance status score of 0 or 1 at baseline. More subjects in the ALECSAT group compared to the Avastin/Irinotecan group were asymptomatic at baseline (66.7% vs. 40.0% of subjects, respectively). All enrolled subjects had advanced cancer of the brain. 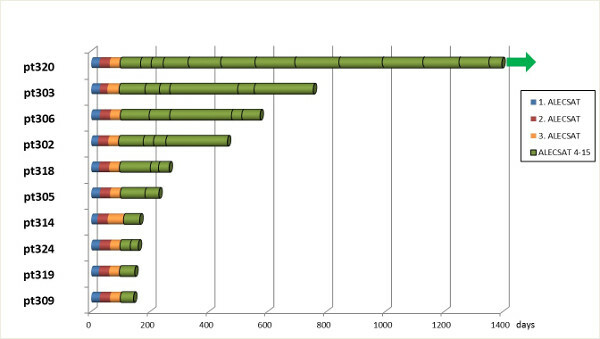 Additionally, most subjects (72.0%) had other concurrent disease reported as ongoing medical history. The most frequently reported medical history terms were hypertension reported by 7 subjects (28.0%), epilepsy reported by 4 subjects, and depression reported by 3 subjects (12.0%). All subjects used concomitant medication during the study. Drug classes used by most subjects were alimentary tract and metabolism products (23 subjects), systemic hormonal preparations (23 subjects), and nervous system products (22 subjects). Median PFS was statistically significantly shorter in the ALECSAT group (32 days) compared to the Avastin/Irinotecan group (163 days) (p=0.0003), and the Hazard Ratio [95% CI] for PFS in the ALECSAT group was 0.16 [0.05; 0.49]. Sensitivity analysis of PFS from first study product administration yielded similar results as the primary analysis. Median OS was not significantly different between the ALECSAT group (150 days) and the Avastin/Irinotecan group (203 days) (p=0.1907). The Hazard Ratio [95% CI] for OS in the ALECSAT group was 0.45 [0.13; 1.54]. Median time to progression was statistically significantly shorter in the ALECSAT group (32 days) compared to the Avastin/Irinotecan group (163 days) (p=0.0001). The Hazard Ratio [95% CI] for time to progression in the ALECSAT group was 0.12 [0.03; 0.42]. PFS event rates (i.e. for no progression or death) were statistically significantly lower in the ALECSAT group compared to the Avastin/Irinotecan group at all time points. The Hazard Ratio [95% CI] for PFS was 0.26 [0.10; 0.69] at month 3 and 0.16 [0.05; 0.49] at month 5. OS event rates (i.e. for no death) were slightly lower in the ALECSAT group compared to the Avas-tin/Irinotecan group, but were not statistically significantly different between the treatment groups at any time point. No subjects in the ALECSAT group had objective response to treatment compared to 6 subjects in the Avastin/Irinotecan group, resulting in an odds ratio [95% CI] for objective response rate in the ALECSAT group of 0.17 [0.001; 0.39]. Overall, the scores for EORTC QLQ-C30 global health status and functional scales were similar between groups apart from a slightly worse cognitive and role functioning and better social functioning subjects in the ALECSAT group at some weeks. Overall, the EORTC QLQ-C30 symptom scores were similar between groups apart from worse gastrointestinal symptom scores (appetite loss, constipation and diarrhoea) in the Avastin/Irinotecan group around treatment, consistent with the expected gastrointestinal adverse reactions for this treatment. Overall, the BN20 global health status and domain scores were similar between groups. However, communica-tion deficit and motor dysfunction domains were worse for subjects in the ALECSAT group at some weeks. Overall, BN20 single item scores were similar between groups. However, subjects in the Avastin/Irinotecan group had worse hair loss, drowsiness and weakness of legs, consistent with the expected adverse reactions for this treatment. Overall, the ECOG performance status deteriorated during the study. At baseline and week 4, a greater proportion of subjects were asymptomatic in the ALECSAT group compared to the Avastin/Irinotecan group. At weeks 6 and 14, the performance status was more similar between the treatment groups and most subjects in both groups were symptomatic but completely ambulatory. Overall, leukocytes increased slightly from baseline while lymphocytes decreased. Leukocyte and lymphocyte values outside normal ranges were reported as not clinically significant. A total of 129 AEs in 23 subjects occurred during the study; In the ALECAT group, a total of 62 events in 13 subjects were reported, corresponding to 2.36 subjects with AEs per PYE. In the Avastin/Irinotecan group a total of 67 events in 10 subjects were reported, corresponding to 3.52 subjects with AEs per PYE. The most frequently reported AEs were nausea (3 events in 2 subjects in the ALECSAT group and 11 events in 5 subjects in the Avastin/Irinotecan group), diarrhoea (1 event in 1 subject in the ALECSAT group and 12 events in 8 subjects in the Avastin/Irinotecan group), fatigue (6 events in 6 subjects in the ALECSAT group and 7 events in 4 subjects in the Avastin/Irinotecan group), and cystitis (4 events in 3 subjects in the ALECSAT group and 3 events in 2 subjects in the Avastin/Irinotecan group). Most of the AEs were of mild (67 of 129 AEs) or moderate (40 of 129 AEs) severity. A total of 22 events had intensity of CTCAE grade 3 or above. A total of 39 events in 11 subjects were assessed as related to study product. Only 2 of these events (diarrhoea and vomiting) were assessed as related to ALECSAT (0.36 subjects with adverse drug reactions [ADRs] per PYE) compared to 37events in 9 subjects in the Avastin/Irinotecan group (3.17 subjects with ADRs per PYE). The majority of ADRs in the Avastin/Irinotecan group were gastrointestinal disorders. Time to first onset of treatment-emergent AE from randomisation was longer in the ALECSAT group compared to the Avastin/Irinotecan group (p=0.0006). However, there was no statistically significant difference between the treatment groups in time to first onset of a treatment-emergent AE from first study product admin-istration. No AEs or SAEs led to discontinuation of subjects. Medical events of special interest (MESIs) were not classified or reported due to early termination of the study. A total of 21 SAEs in 13 subjects were reported during the study. Of these, 2 events of embolism (1 moderate and 1 severe) in 2 subjects in the Avastin/Irinotecan group were assessed as related to study product. One subject died during the study due to progression of GBM. No clinically significant values were reported for any high or low out-of-range biochemical or haematology laboratory parameters, and no AEs were reported for any laboratory values. There were no obvious differences between groups in vital signs. Abnormal physical examination results were found for abdomen, ears/eyes/nose/throat, extremities and head. Overall, more abnormal results were found in the ALECSAT group compared to the Avastin/Irinotecan group. Overall, the ALECSAT treatment appeared well tolerated and no safety concerns were raised. There were fewer treatment-emergent AEs and treatment-emergent ADRs in the ALECSAT group compared to the Avastin/Irinotecan group, especially the incidence of gastrointestinal events were different between groups. The frequencies and preferred terms appearing were in line with expectations for a study in this indication and study population. Data from the study showed that second line treatment of late stage GBM patients with ALECSAT could not extend PFS or OS when the treatment was given as monotherapy. This may due to the fact that ALECSAT was adminis-tered 28 days later than control treatment was initiated in the reference group, and the delay in treatment may have caused early discontinuation of subjects due to progression of disease. The rapid disease progression of GBM together with the treatment regimen used in this study precluded the detection of any delayed effects of ALECSAT treatment. The ALECSAT treatment appeared well tolerated and no safety concerns were raised. This study will be conducted at multiple clinical sites located in Sweden, currently Sahlgrenska University hospital is actively recruiting patients. To compare Overall Survival (OS) between patients who received ALECSAT as an add-on therapy to standard of care (SOC) and patients who received SOC treatment only. To compare OS rate at 12, 24 and 36 months between patients who received ALECSAT as an add-on therapy to SOC and patients who received SOC only. To compare the Progression Free Survival (PFS) time between patients who received ALECSAT as an add-on therapy to SOC and patients who received SOC only. To assess the safety of ALECSAT treatment. This is a randomised, open-label, multi-centre, Phase II study in patients with newly diagnosed glioblastoma multiforme brain cancer. Up to 87 patients with newly diagnosed glioblastoma will be enrolled in the study in a 1:2 allocation (SOC: ALECSAT as an adjunct therapy to SOC). Data from further 29 patients collected from an ongoing observational study of Glioblastoma patients treated according to SOC at Sahlgrenska University hospital in Göteborg, Sweden will be used as historical control data and combined with the randomised control data in performing the statistical analysis. Standard of care therapy for newly diagnosed glioblastoma (first line therapy: Stupp regimen, followed by second line therapy at the Investigator’s discretion). The allocation ratio will be 1:2 (SOC: ALECSAT as an adjunct therapy to SOC). Patients will be screened (Week -4 – 0) and will enter the study within six weeks of their glioblastoma resection. Eligible patients will be randomised to either ALECSAT treatment as an add-on therapy to SOC, or SOC only. All patients will complete the radiotherapy phase of the Stupp regimen (radiotherapy five days per week combined with daily TMZ) for approximately six weeks (Weeks 1-6). Then all patients will begin TMZ treatment four to five weeks after completion of radiotherapy, typically six cycles of TMZ will be given (daily for five days every 28 days). Patients who terminate radiotherapy or TMZ treatment early for any reason will be allowed to remain in the study. For all patients first line Stupp treatment will be followed by second line treatments at the discretion of the Investigator. Patients randomised to the ALECSAT treatment arm will after the radiotherapy phase – alongside (adjuvant to) TMZ treatment – receive three doses of ALECSAT at four week intervals during the loading phase of the study (Weeks 8-16). Following the loading phase, patients in the ALECSAT treatment arm will enter the maintenance phase, where they will receive further ALECSAT administrations during the maintenance phase at 12 week intervals (Week 17 onwards). Patients in the ALECSAT treatment arm may also receive second line therapy at the Investigator’s discretion. The maintenance phase of ALECSAT administrations will continue for patients in the ALECSAT treatment arm until death or until a patient discontinuation criterion is observed or until closure of the study (24 months after recruitment has closed). Patients randomised to the control arm will follow the same study plan and undergo the same study procedures as patients in the ALECSAT treatment arm (with the exception of blood donations for ALECSAT production, ALECSAT administrations and vital signs). Patients randomised to the ALECSAT treatment arm will be allowed to remain on ALECSAT treatment if disease progression is observed and second line treatment is initiated. The final analysis will be carried out when 86 events (deaths) have been observed, including those from historical controls. Twenty-four months after recruitment to the study has closed, treatment and data collection for any patients still alive will end and the study will close. Any data collected for patients still alive after the point of final analysis (86 events) until study closure (24 months after recruitment has closed) will be analysed and included as an addendum to the final report. There will be two interim analyses. The first analysis will be carried out 18 months after the start of recruitment and will be used to confirm continuation of the study. The second interim analysis will be carried out before all patients have been recruited and will be used to make any study recommendations such as adjustments to the sample size. There will be an independent Data Safety Monitoring Board (DSMB) that will evaluate the data collected during the interim analysis and provide recommendations on further conduct of the trial. Number of patients: Up to 87 patients will be enrolled. Male or female patients, aged between 18 and 70. Histologically confirmed, newly diagnosed glioblastoma, including gliosarcoma. Eligible for combined radiotherapy and TMZ treatment. Patients with complete or partial tumour resection. For patients with limited tumour volume, biopsy is acceptable. Body weight ≥ 40 kg (males), ≥ 50 kg (females). Able and willing to provide written informed consent and comply with the study protocol and procedures. Women of child-bearing potential must have a negative pregnancy test at screening and agree to use acceptable methods of contraception during the trial. Prior treatment for brain tumours at study entry. Prior treatment with temozolomide at study entry. Positive tests for anti- human immunodeficiency virus (HIV)-1/2; HBsAg, anti-HBc, anti-HCV or being positive in a Treponema Pallidum test (syphilis). Patients from high incidence areas for Human T-Lymphotropic Virus (HTLV-1) virus or who has a parent or spouse from a high incidence area must be excluded unless tested negative for HTLV-1 virus. Known allergy to study medication. Any condition or illness that, in the opinion of the Investigator or medical monitor, would compromise patient safety or interfere with the evaluation of the safety of the investigational drug. Any concurrent illness that may worsen or cause complications in connection with blood donation, for example uncontrolled epilepsy, cardiovascular, cerebrovascular or respiratory disease. Use of immunosuppressant drugs with the exception of steroids. Blood transfusion within 48 hours prior to the donation of blood for ALECSAT production. Low haemoglobin count in the opinion of the Investigator. Lymphocyte count <0.3 x 109/litre. Participation in any other interventional clinical trial within 30 days prior to inclusion. Dose: 1 x 107- 1 x 109 cells suspended in 20 ml plasmalyte solution. Dosing schedule: Loading phase (Weeks 8-16) – approximately three doses administered at approximately four week intervals. Maintenance phase (from Week 17) – dose administered every 12 weeks until death or until a patient discontinuation criterion is observed or until closure of the study (24 months after the recruitment has closed). Patients randomised to ALECSAT treatment will also receive the reference treatment as stated below. The reference treatment is standard of care first line therapy for newly diagnosed Glioblastoma according to the Stupp regimen. Stupp treatment includes a combination of external radiotherapy (daily fractions of 2 Gy per fraction five days per week up to a total dose of 60 Gy) and temozolomide (75 mg/m2) daily for approximately six weeks. Patients who terminate radiotherapy or TMZ treatment early for any reason will be allowed to remain in the study. Patients then begin adjuvant TMZ treatment four to five weeks after completion of radiotherapy. Typically, six cycles of TMZ will be given (daily for five days every 28 days). TMZ will be administered orally at a dose of 150 mg/m2 per day for the first treatment cycle. The dose of TMZ will increase to 200 mg/m2 per day in the subsequent treatment cycles, in the absence of haematological toxicity. Patients may also receive second line therapy, at the discretion of the Investigator as part of standard of care. The data gathered from this study will be combined with data gathered from an ongoing observational study of glioblastoma patients treated according to standard of care at Sahlgrenska University hospital in Gothenburg, Sweden. Overall Survival (OS). OS time is measured from time of resection until death for any reason. Proportion of patients alive at 12, 24 and 36 months. Time from resection to objective demonstration of disease progression or death (PFS), whichever occurs first. Disease progression will be measured by MRI scans interpreted according to the Revised Assessment for Neuro-Oncology (RANO) criteria. All data will be presented in patient data listings. Data will be summarized by treatment groups. For continuous variables, descriptive statistics (n, mean, median, standard deviation, minimum, and maximum) will be presented. For categorical variables, frequencies and percentages will be presented. Graphical displays will be presented as appropriate. The expected hazard ratio in favour of the ALECSAT+ SOC therapy is assumed to be at least 0.585, which is equivalent to a median time of 25 months. Under these assumptions, the number of events (deaths) required for the final analysis is 86. Contributing to this number will be data from 29 historical controls, whose time of death has been observed. The remaining 57 events will come from the 87 patients randomised to the study in a 1:2 allocation (SOC: ALECSAT as an adjunct therapy to the SOC). Assuming 25 months for recruitment of the 87 patients, the final analysis will occur when 57 deaths have been observed among randomised study subjects, or approximately 46 months after study initiation. Two interim analyses and one final analysis are planned. The first interim analysis will take place 18 months after the start of recruitment, at which time 61 patients are expected to have been randomised into the study and at least 14 deaths have been observed. The second interim analysis will be performed when 50% of the events (24 deaths) have been observed or 6 weeks before all patients have been recruited (after approximately 85 patients have been recruited), whichever time point is first. At this time, the selection of historical controls to be included in the trial will be performed. The final analysis will be performed when 86 events (deaths) have been observed including those from historical controls. Any data collected after this time point up to study closure (24 months after recruitment has closed) will be analysed and included as an addendum to the final report. The error probability will be adjusted for multiple testing (interim analyses) according to the Haybittle-Peto boundaries  i.e. that p1=0.001, p2=0.001 and p3=0.05. Demographics and Baseline Characteristics: Demographic data – age, gender – will be described using n, mean, median, standard deviation, minimum, and maximum for age and percentages for gender. Corticosteroid treatment will be described by frequency tables. The primary endpoint – Overall Survival – will be analysed using the Kaplan-Meier survival estimate and compared between the treatment groups using a log-rank test. Progression Free Survival will be analysed in the same manner. Estimates of median Overall Survival and median Progression Free Survival will be calculated using the Kaplan-Meier method. The data gathered from an ongoing observational study of glioblastoma patients at Sahlgrenska University hospital in Göteborg, Sweden will be included into the randomised trial as historical control data. To combine the data from historical controls with the randomised controls, the method described by Stuart Pocock will be used. According to the algorithm described, the number of concurrent controls in the randomised trial can be limited. The calculation takes into account the number of historical controls and a bias in the median survival time estimated from the historical controls, as well as the total number of patients in the trial. The comparison will include demographic data, patients’ baseline characteristics and other prognostic factors as covariates in a COX proportional hazard model. Adverse events will be displayed using frequency table methods, presenting number of patients and percentages. Safety laboratory parameters will be presented as mean values, standard deviations, medians and minimum and maximum values.